RIO GRANDE, Ohio — Ohio Valley Bank recently unveiled a new debit card design as part of its Community First debit card program. 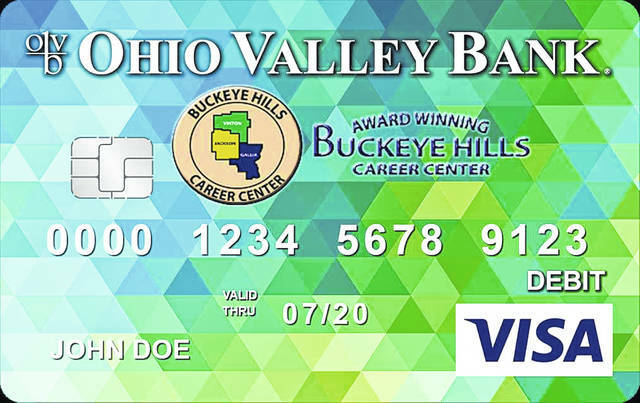 The Buckeye Hills Career Center Visa® debit card is now available at all Ohio Valley Bank locations. The school will receive five dollars for every OVB customer that chooses to upgrade to the new card design. Thirty-two local designs have been released by Ohio Valley Bank in an effort to make a positive impact on its communities. The Buckeye Hills card design features the school logo on a vibrant field of blue, green and yellow. Through the Community First debit card program, bank account holders may upgrade the look of their debit card to one designed for their favorite local school or charity. The upgrade is available for a $10 fee with half donated back to the school or charity. Designs are also available for most area schools and many local charities. Bank staff are currently working to add more local designs to the mix. Officials from schools or local charities wishing to participate in the program should email communityfirst@ovbc.com. More information on the cards and a look at the currently available designs can be found at www.ovbc.com/communitycards. Ohio Valley Bank, established in 1872, operates 19 offices in Ohio and West Virginia. The Bank’s parent company, Ohio Valley Banc Corp., also owns Loan Central, a consumer finance company specializing in tax services. Common stock for Ohio Valley Banc Corp. is traded on The NASDAQ Global Market under the symbol OVBC. More information can be found at Ohio Valley Bank’s Web site at www.ovbc.com, or on Facebook at www.facebook.com/OhioValleyBank.